Aldon - Removing candle wax drippings, floor wax, etc. Caution! Some wax removal products are petroleum base and may damage paint or color stain on wood furniture. Usually, Aldon "Insta-Clean" is all that is necessary and is not a petroleum base product. Patch test first. Apply a small puddle on the wax and let it sit for a few seconds. Gentley rub and feel the wax break down. Wipe clean. Question - what do you do with the rest of the bottle when only a tablespoon or less was used on the wax. Answer - clean anything else with oil/grease base. Car engine, soot, dirt on lawn furniture, etc., etc. Wax: Removal Of Large Areas, Penetrated Into Surface, Etc. will remove all the wax it can reach. It will also remove a good deal of what is beneath the surface. If penetrated wax has caused some discoloration, try flooding the area with lacquer thinner and blot out as much as possible. 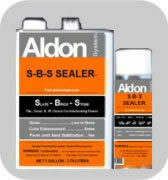 Wax will impede penetration of any sealer, including Aldon "S-B-S Sealer", but S-B-S is the best sealer to use in this situation. S-B-S Sealer will also darken the surfacing a bit and tend to disguise remaining color differences. Watch for excessive sealer buildup in some spots due to the wax, and reduce the sealer buildup later with lacquer thinner.